Click on sections of image for more information. A CONFEDERATE CEMETERY was created on land donated by James Madison Griffin, owner of the Atkinson-Griffin House. In 1872 some twenty bodies on Confederates were buried within the stone walls of this property. The Scotch granite monument was manufactured at the marble works of T. Joyce, Louisville. Annual celebrations of both Union and Confederate soldiers were held there until 1911. In the 1940s a concrete base was made to protect the granite marker. 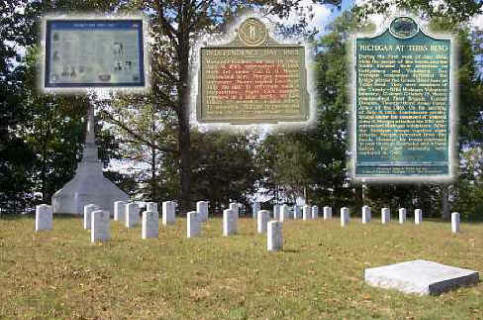 In 1988 on the 125th Anniversary of the battle, a Michigan Highway Marker paid for by the Holland-Zeeland Civil War Roundtable, commemorated the Michigan regiment's stand here.